Believe it or not, I have only very recently discovered the convenience and, yes, joy, of slow cooking in my home. I incorporated this very traditional method of food preparation using clay pots which I have found to be quicker (and safer) than using a crockpot, Instapot, or stainless cookware. My oldest child goes off to college very soon. The reality of him subsisting on unhealthy, highly processed college food after being raised on an organic, whole food diet for his entire life has been weighing on my mind for some time. As a result, I’ve been in search of an easy to use appliance in which he can quickly and safely prepare simple meals for himself as needed. A crockpot might seem like the perfect solution at first. However, I’ve never been thrilled with this option for several reasons (no offense to those of you who love them!). First, most models are made with teflon, aluminum, and other unsafe materials. Even the few stainless steel models pose the problem of leaching heavy metals like carcinogenic nickel into your food when you cook acidic dishes such as tomatoes (1). Old time cast iron slow cookers aren’t necessarily better. These can contribute to the little known health issue of excess iron in the diet. Doctors call it iron overload disorder. This is of particular concern for adult males and menopausal women and recognized as a risk by science. From a practical perspective, crockpots don’t cook fast enough for me let alone a busy college student. I’ve also avoided the fast cooking Instapot or other types of pressure cookers. I am not convinced that this unnatural way to cook food quickly doesn’t in fact greatly increase glutamates (MSG) in the food. This is especially risky when you make bone broth or tomato based dishes. Pressure cookers are mostly made with stainless steel. This type of material introduces the very real risk of leaching toxic nickel when cooking acidic foods. I prefer an appliance I can use in all cooking situations! Finally, while crockpots do produce moist, juicy results, I haven’t been overly impressed with the flavor of the crockpot or Instapot meals. They taste bland and maybe a bit overly boiled to my palate. Of course, adding a lot of seasonings covers this up. The most nutritious food tastes amazing with little seasoning, however. Hence my laid-back attitude toward slow cooking and pressure cookers until I discovered an affordable appliance that combines modern technology and convenience with the benefits and safety of traditional clay cooking. This appliance which I literally cannot live without after using for 2 years is called the Vita-Clay. Cooking in terra cotta clay pots is an ancient tradition that dates back to the Etruscan civilization that existed around 800 BC. Today, this area in central Italy that includes the city of Florence is known as Tuscany. I was fortunate to be able to visit Tuscany in the Fall of 2015. This travel experience made research into the subject of even greater personal interest. Cooking in clay pots is different than cooking in other materials such as ceramic or stainless steel. The primary difference is the porous clay. No enamel or glaze means the hard-baked clay “breathes”. Thus, water is absorbed and then released during cooking to achieve moist, intensely flavorful results with little to no seasonings. Slow, steady evaporation of steam from within the clay pot’s unglazed pores and the double sealed lid is what makes this possible. … the clay cooker cooks with a minimum of liquid and retains all the intense flavors of every ingredient, achieved by simmering in its own juices. More of the essential nutrients and vitamins are retained in foods cooked in clay pots because food cooks in a closed environment with limited liquids. In addition to intensely flavorful food, the moist clay combined with the double lid design of the model I use, the 8 cup Vita-Clay, creates a micropressure environment which allows for much improved cooking efficiency. This means you save electricity and time. In fact, clay pot cooking can have your meal ready in up to half the time compared with using other slow cookers. Speedy slow cooking using clay pots was not the only thing that got me excited about Vita-Clay. You can set the meal to cook and when it is ready, use the delay function to keep it warm until you’re ready to eat. In addition, clay pot cooking is not just suitable for stews. These appliances also cook rice, oatmeal, bone broth, and soups. They even make yogurt! Below is a picture of the compact, personal Vita-Clay model I am going to send off to college with my son. Would you believe it costs less than $50? And, if the clay pot chips or breaks for whatever reason, it can be easily replaced without buying a whole new cooker. Clay pots are very resistant to damage by the way, so the chances of this happening are low. Update: I’ve now used Vita-Clay for two years. I have all three sizes depending on what type/size meal I need to cook. No chips or breaks yet. These pots are very durable! How about cleaning the clay pots? No dishwasher is necessary although you can use one if you like. Note that dishwashers might discolor the clay pot slightly or cause some lime buildup. To clean, all I do is rinse it out first. Use a drop or two of mild dish soap if desired and a soft dishwashing brush. Then, rinse and wipe clean. If there are some cooked on bits of food, I soak for an hour or so in plain water in the kitchen sink. Then, dump the water and wipe clean. For tougher to remove food bits, soak overnight using 1 cup water, 1/4 cup white vinegar, and 1 tablespoon baking soda. Rinse and wipe the following morning. I’ve actually never had to use this approach. Little to no scrubbing is necessary in my experience even when I cook rice. What About Toxins in Clay Pots? One of the very first questions I asked before considering cooking in a clay pot was: would it be safe and toxin-free for my family? The clay pot I use made by Vita-Clay is manufactured using organic Zisha clay. Zisha is an extremely pure clay, tested to be free from contaminants. This special clay was formed over thousands of years by rainfalls that scrubbed the mountains in southern, nonindustrialized China. These rainfalls released minerals into pristine lakes forming huge clay beds. Most risk of lead contamination comes from glazed, ceramic dishes and pots. 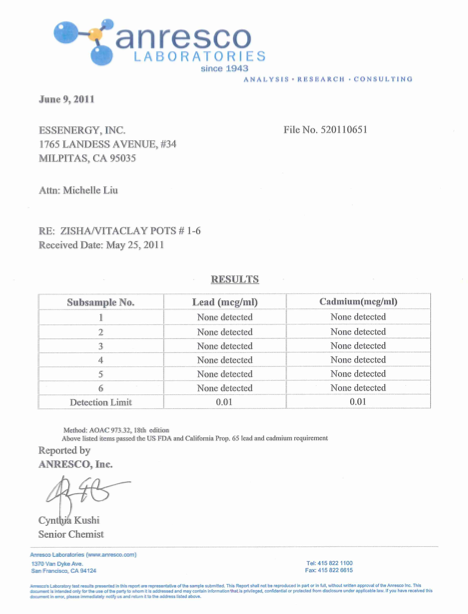 The Zisha clay pots are unglazed and have been certified by an independent third party lab as lead-free (test results here). They meet the FDA, CA 65, and UL safety requirements. No chemical treatments are applied to the clay during manufacturing. The dishes I love making in the clay pot cooker are soups, stews, soaked rice, soaked oatmeal (soak and cook in one step!) and yogurt. Yes, you can easily make yogurt (using any type of milk: dairy, coconut, almond) in the Vita-Clay! For now, let me share with you my favorite soup recipe in the Vita-Clay. Just throw in all the ingredients, turn it on and you are done. This is a very easy option for dinner on nights when the schedule is challenging and hectic. Easy recipe for split pea soup made in a slow cooker clay pot. Put all ingredients in the clay pot right after lunch around 1pm and close the lid. Turn on the "stew" setting for 3-4 hours. Dinner will be ready around 5pm. If you wish to eat dinner at a later time, the Vita-Clay will automatically keep things warm until then. In a pinch, filtered water or a mixture of bone broth and water can be used. If you buy instead of make bone broth, only buy bone broth packaged in glass jars. Other brands have toxic packaging issues. I like to soak split peas before cooking to increase digestibility and nutrient availability. To do this, put the split peas in a glass bowl with a teaspoon or so of sea salt, cover with filtered water and stir. I do this right after breakfast. You can also do it before you go to bed the night before if that’s easier. Then, after lunch, I drain off the water and put the soaked split peas and remaining ingredients in the Vita-Clay. Gently simmer into a hearty soup and dinner is done by 4-5pm! Bonus: the Vita-Clay settings keep the meal warm until you are ready to eat. The brief video below shows me using a Vita-Clay to make dinner. See how easy it is? Want to Try Cooking in Clay for Yourself? If this article has you excited to try cooking in clay pots too, note that there are several models to choose from. Click here to check out all the sizes and models available. Use coupon code WISE25 to order what you like best at 10% off. You won’t believe how reasonable the prices are! Have you already tried cooking in clay pots? If so, what is your experience and what are your favorite dishes to create? Disclosure: I was NOT paid to write this post although I was provided a Vita-Clay in order to personally verify all product claims. I wrote this article because I am a big fan of the Vita-Clay since researching about the benefits of clay pot cooking and cooking with it constantly over the past two years. Some of the links in this post are affiliate links. I truly believe in what this company is doing to produce a safe, quality product for the public.